It’s been a while since we’ve made a simple loaf cake from BCM, and Saint-Pierre Poppy Seed Cake was an easy one to pull off this week. 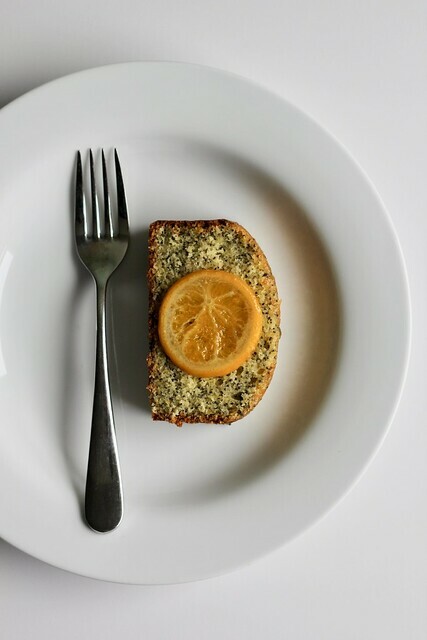 Rather than the standard lemon-poppy seed combo, this uses orange, and the result is a very sunny and not too sweet tea cake. It’s a rich cake, though. In addition to butter and poppy seeds, the batter also contains a good amount of heavy cream. When I buy organic citrus, I try to remember to freeze the zest if I’ve not already planned to use it. I have a little baggie with packets of various zests in my freezer drawer and I dipped into that here to find some orange zest. Since I was using the frozen zest, I also needed to find some juice. My juice turned out to be Grand Marnier…I guess I’m lucky I don’t have scurvy. Dorie is not shy with the poppy seeds here– the full recipe has a whole 1/3 cup of them, so make sure they’re fresh or they’ve been properly stored (airtight and in the freezer, as she recommends). 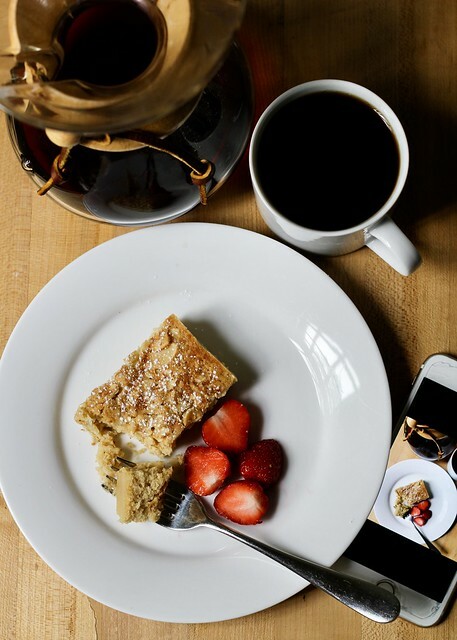 Unlike most poppyseed muffin recipes, where I often feel like the couple of tablespoons of seeds are mostly there for looks, you can taste them in this cake, and they crunch. Dorie says this tea cake is meant to be served plain, but I can never resist a little dressing up, so I took home a few slices of candied clementines from work to garnish my pieces. Alstatian Christmas Bread (aka baerewecke) is a bit of a project, but it also couldn’t be easier. It’s not a bread that needs flour or yeast, just dried fruit and nuts. Instead of rising time, it needs chopping and mascaerating time…also some shopping time to gather ingredients. This uses all sorts of yummy dried fruit- figs, apples, pears, raisins, apricots and prunes- plus walnuts and almond flour. The fruit is cut and soaked in juice until it’s very soft and makes a sticky paste when mixed with the nuts. Form the paste into logs, bake them until they hold together, and you’re done! This is one of those things that, like fruitcake, lasts a long time and probably even gets better with age. I made mine a few days before I first cut into it, and I still have the second log sitting in my chilly kitchen. I’m thinking of mailing it to my mom in Seattle, because I think she’d like it. By itself, it’s gluten free, dairy free and vegan. 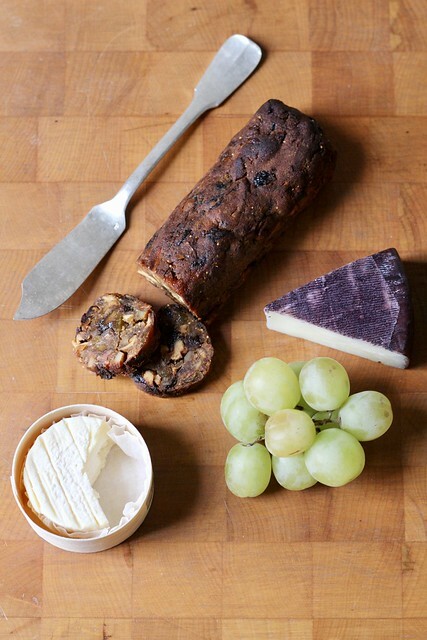 You can nibble on this like a snack or energy bar, but I think it’s also great with cheese. If I make a cheese plate I always like to have some sort of jam or fruit paste on the side, and this is a perfect accompaniment. 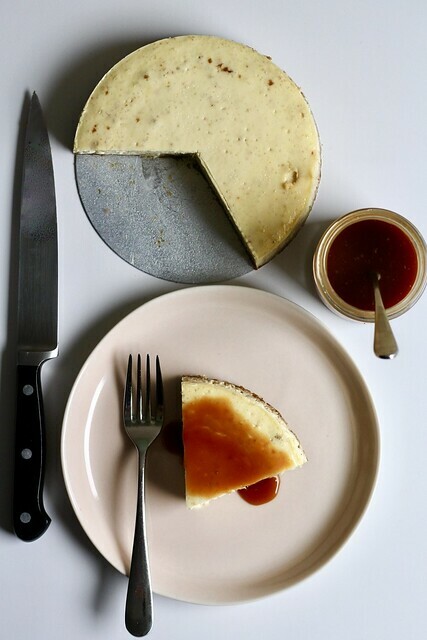 Le Cheesecake Round Trip is a cheesecake Dorie makes in both in New York and in Paris. In fact, she’s been known to smuggle ingredients in her suitcase from one continent to another to make it. With a filling of all-American cream cheese and a Paris-ized crust of spice cookies and almond flour, it contains a bit of both worlds. We actually make a crispy little spice cookie at work, and there is always scrap, so I just took some of that home to bake and grind into crumbs for this. A portion of the crumbs gets reserved to mix into the filling, giving it little freckle-speckles. I always whiz my cheesecake fillings together in the food processor. It’s easy, fast and lump-free. I made a half-sized cheesecake in a six-inch pan, but I only used a quarter of the filling (one block of cream cheese). So mine was a low-rider, but still very rich and satisfying. Dorie says that during baking the top of the cheesecake will brown and may even crack. Mine didn’t do either of these things, but I think that’s because it had so much less filling that it didn’t need enough time in the to get brown before I declared it c’est fini. While a drizzle of salted caramel on top of Le Cheesecake is very good indeed, so is fruit sauce or jam or chocolate sauce. Cheesecake lasts a few days, so you can play around with options. I like the little nutty, buttery French cakes called financiers. 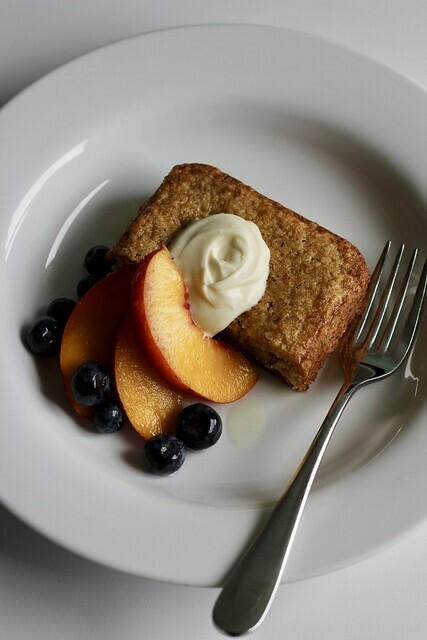 These Cowgirl Cornmeal-Pecan Financiers are a perfect Franco-American take on the classic. An easy melt-and-mix batter flavored with cornmeal, ground toasted pecans and plenty of browned butter bakes into a decadent treat. I have a silicone mold that’s in the traditional financier bar shape and used it here instead of my mini muffin tin. To avoid eating too many of these tasty butter bars, I decided to cut just one into bite-sized pieces and kind of extend it into a larger dessert with some berries, dulce de leche whipped cream and candied pecans. I plated it up pretty for a picture before giving it to my husband. Then I took the same components and just tossed them together in a little bowl for myself. Equally delicious, although maybe less photogenic. If you’re as on-trend as I am (hahaha), you’ll have heard of fika, which is not at all a trend in Sweden, but a ritual. It’s a proper sit-down, slow-down coffee break, complete with treats. Of course I am hopeful that something this delightful will turn from Scandi trend to full-on tradition on this side of the Atlantic, too, and I’m willing to do my part to enable it. If I’m ever visiting someone, or having someone visit me, for fika, I’m making Swedish Visiting Cake Bars for treat-time. These bars contain no leavening agent and are thin and dense, but they’re not heavy. They have that almond paste cake taste and feel but are actually flavored with extract. They aren’t too sweet and are an ideal coffee or tea companion. I made Dorie’s original cake version of these bars something like eight years ago (whelp!). 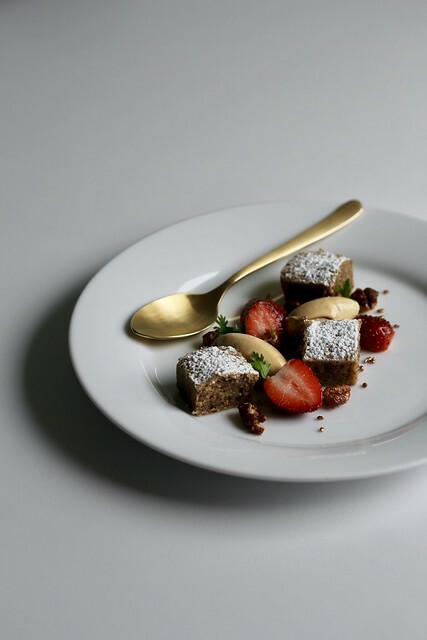 I think the main difference between the two, besides the shape, is that the cake just had a scattering of sliced almonds on top, while the bars have an upgraded topping of crackly sugar-glazed almonds. Making that topping gave me a déjà vu feeling, too…then I looked back and realized I’d used it before on a pear tart. I like this kind of mix-and-match, taking good parts from one thing to improve another. For the recipe, see Dorie’s Cookies by Dorie Greenspan. Don’t forget to check out the rest of the TWD Blogroll and please join us if you haven’t already! A couple of summers ago the group made the Rose Fraisier cake from BCM. I’m not exactly sure why I sat that recipe out, but it most likely had something to do with not wanting to make pastry cream. Flash forward two years and I still don’t feel like making pastry cream (some things don’t change), so I decided for this rewind to make Dorie’s Bonne Idée take on the recipe. Instead of being a multi-component layer cake, it’s a simple Rose-Sented Loaf Cake. When I say simple, I mean simple. It’s a yogurt and oil-based cake you can stir up in about five minutes with just a bowl and a whisk. I’m pretty sure Dorie uses the base recipe for several other flavor variations because, not only is it a very good cake, making it felt very familiar to me. I made a half-recipe of the cake batter and rather than baking it in a loaf pan, I put it into my baked donut pan. That pan had gotten zero use because I’ve decided that I like my donuts fried (and also purchased at a donut shop so I don’t have to do the frying). 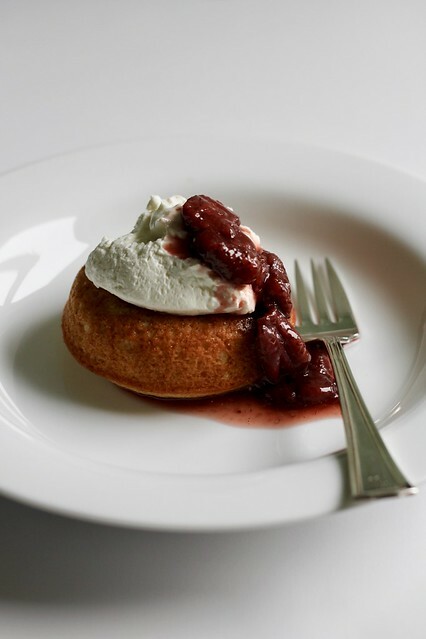 But a baked donut pan is really just an individual cakelette pan, and one that gives a nice little divot in the middle for piling on yogurt whipped cream and roasted strawberries to boot. Even though I was too lazy for pastry cream, I still wanted the flavors of the Rose Fraisier, and the rose-strawberry-cream combination is a lovely and elegant one. 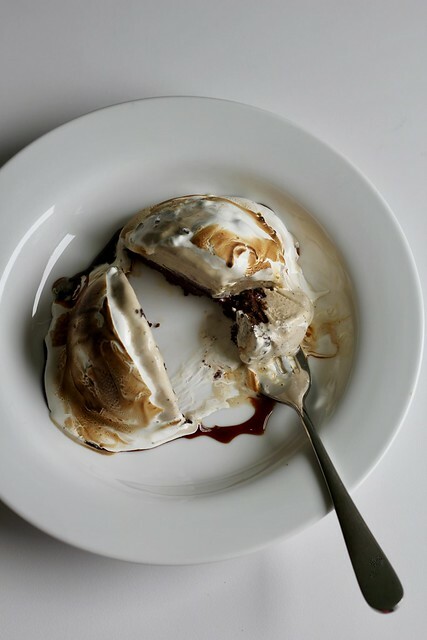 For the recipe, see Baking Chez Moi by Dorie Greenspan. Don’t forget to check out the rest of the TWD Blogroll to see other rewinds! 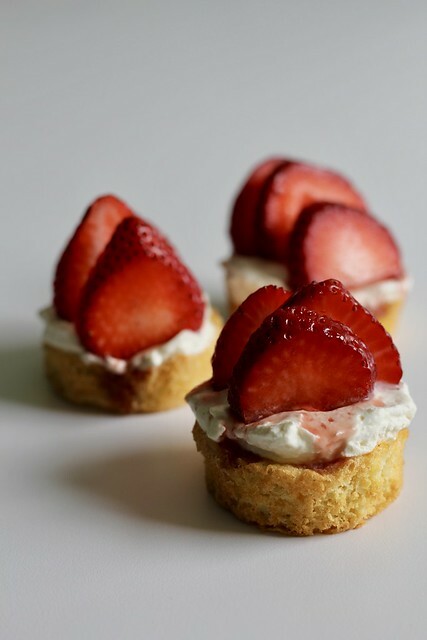 Let’s get one thing straight about these Strawberry Shortcake Cookies– they are cakes. If we are calling them cookies, it’s only because they are little two-bite babies. This is about the easiest sponge cake in the world to make, though, and the batter bakes up into nice little rounds in a muffin tin. 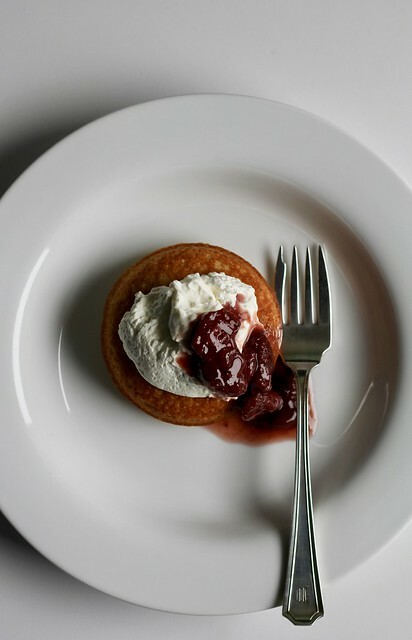 Each round is a self-contained shortcake, with a small blob of strawberry compote (I used some roasted strawberries I made for something else a while back, although you could also just use jam) topped with some sweetened whipped cream and sliced berries. I made the sour cream whipped cream because I like the tang alongside the sweetness of everything else. These weren’t hard to make, but they are tasty and pretty. You can make the little sponges ahead of time (I have some in the freezer now) and top them as you need them. As the summer moves along, other berries will work just as beautifully. I like the concept of a “weekend cake.” It’s good to have a simple, sturdy cake that lasts for several days and travels well. Something reliable and something that everyone will like. This Apple Weekend Cake fits the bill nicely. 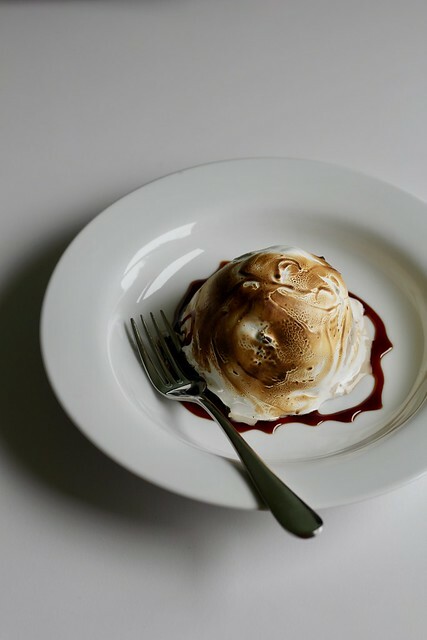 It’s good for dessert, afternoon tea or for breakfast, so it’s multipurpose as well! Though it’s meant to be a loaf, I baked my batter off in a muffin tin. I swapped out a third of the plain flour for rye flour and kept my apple pieces chunky for some texture. I like that in addition to cinnamon and vanilla, there’s some rum in the batter. 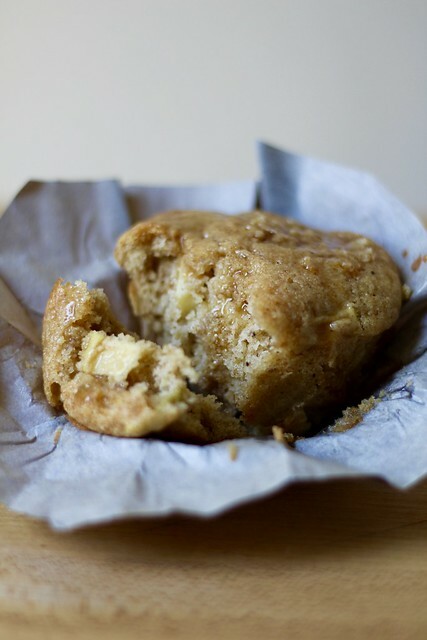 Apples and rum are BFFs in baked goods. The apple keeps this cake very moist. It hadn’t dried out at all three days later…in fact, I think it tasted better over time. I drizzled my cakelettes with a bit of reduced apple cider that I boiled down a couple of weeks ago.